The preset location address: 6/a Via Mariano Stabile,, Palermo, 90100, Italy, area 'Palermo'. Best rates. OrangeSmile.com provides cars for hire at the rental point 'Palermo' at the lowest guaranteed prices. Our direct car suppliers often provide high discounts on the available models. For your specific dates at 'Palermo', we will find for you the best online car hire offers. The rental process consists of 3 simple steps: (1) search available cars for your dates at 'Palermo'; (2) select the car type you wish to rent; and (3) complete the reservation form. Once your reservation at 'Palermo' is processed, we will send the confirmation voucher to your email address. A valid credit card is required to confirm a reservation at 'Palermo'. Please check your rental conditions, prior making the reservation. At the point 'Palermo', you will be asked for your confirmation voucher, driving license and a valid credit card. A credit card is required for a safety deposit. The deposit amount at 'Palermo' depends on the driver's age and the rented vehicle type. The definitive payment is usually performed at the pick-up point. Our car suppliers at the point 'Palermo' accept VISA, Master Card and other card types - please check your rental conditions. 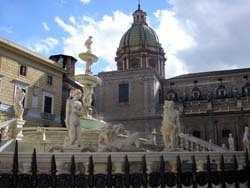 OrangeSmile.com wishes you safe roads in Italy and a pleasant trip to Palermo! The visitors of the restaurant will find a vast assortment of sea foods on the menu. Each dish served there features a unique artistic setting. A part of the restaurant is taken with a bar. Pizza fans will hardly find a better place in Palermo than the Il Baro restaurant. By its decoration the restaurant resembles an old tavern. A popular Italian treat is cooked there in real stone ovens. In addition to pizza the guests of the eating house are offered a vast choice of refreshing drinks.